Today I want to show you some patterns of gold prices from last few decades. There is no interpretation or conclusion but some findings and observations on gold price fluctuations in India. From last 10 yrs gold has been on a bull run and prices have multiplied many folds. In the last couple of weeks, gold prices have been extremely volatile and some analysts also predict that gold price upside movement is in threat. So I found gold prices for last 86 yrs (1925 – 2011) and did some number crunching and some graphs from which we get some interesting findings. I found out the price difference for every 4 yrs period i.e. 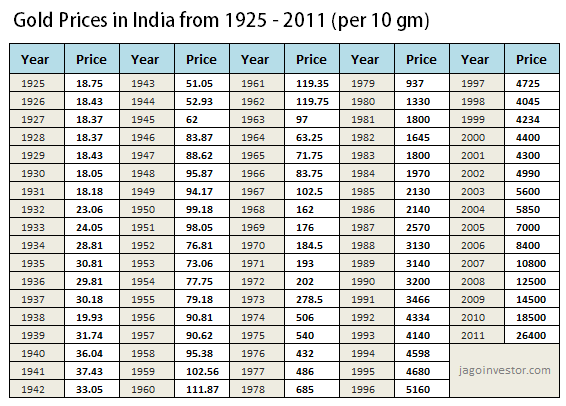 from 1928 to 1925 (yrs) and saw what exactly was the difference in the prices, then 1929 – 1926 and so on… till 2007-2011. Just to give you an idea, gold price in 2008 was 12,500 and in 2011 it was 26,400; so the price difference was 111.20%. I used these data to plot a running 4 yrs price difference so at any point of time you can see how much was the return in those 4 yrs prior to that point. Note that this change in absolute in difference. The major point to note is that majority people think that gold has performed outstanding post 2000 in a time frame of 4 yrs. But from the graph you can see that in 70’s time the 4 yrs period return was much more than what investors saw in recent time. This one is just like above chart, but this time its 8 yrs price difference. We are trying to catch that was the price change in an 8 yrs period. So for example, price in year 1980 was Rs 1330, then after 8 yrs – in 1987, the price was Rs 2570, which is a 93.23%… So like this I calculated the price difference for all the 8 yrs period and graphed it. There are very less 8 yr holding period when the returns from gold was negative, that happened 50’s and 60’s and just 90’s end. The next chart is the CAGR return chart for 4 yrs time frame and the graph is for running periods… that means 1925-1928, 1926-1929… 2008-2011. CAGR return is the main indicator of the performance of any instrument. If you look at the chart below you can see the ups and downs in gold performance and you can see how gold has performed in short run (4 yrs period) for a long time line. You can see that gold returns touched 20%-25% in 70’s and even in recent time it has performed wonderfully… which we all are aware of :). Then you can see the graph below which shows CAGR return on 8 yr running period. The interesting a little obvious fact is that it hardly gave any negative return in any 8 yrs time frame, only during 50’s and late 90’s it has performed badly. The real test of gold comes from a very long term performance and if we see a 20 yrs CAGR return on rolling basis (1925 – 1944, 1926-1945… 1992-2011), then you can see that most of the times the returns has been in the range of 5-10% and only in the 80’s people got best return if they had bought it in 60’s. This chart is interesting; it calculates the CAGR return of GOLD from 1926 to all the years. I mean CAGR return from 1925- 1926, 1925-1927, 1925-1928 and then 1925-2011… So the base year is always 1925. This shows you what was the very long term CAGR return of gold considering it was bought in 1925. In a way this does not give us very strong conclusion, but still shows us some perspective. This graph is same as above just that the base year taken was 1960 so considering gold was bought in 1960, the graph shows the CAGR return for different holding periods. You can see that apart from those who sold the gold in 80’s realised the best CAGR return, but those who held it for long, still have the returns in range of below 10%. The last chart I want to show is with base year of 1980, you can see that over the long term the returns have converged to 10% & only in the last 10 yrs you can see the returns again going up. What are your conclusions based on these charts ? What do you think about gold price movement from this point onwards ? Pingback: Gold: An Investment or a Risk-Management tool? Where on the internet? Is it a reliable source? I am not emotional about Gold at all but now i know why people buy it- As hedge against inflation. Although they sell it if there is no other avenue. But i dont understand why is government trying to curb purchase of gold? wont it lead to smuggling? Cant governments push ETF in a big way so that they can curb smuggling?? May I ask where you got the raw data from? Am I right in assuming this is the nominal price of gold in INR? I got it from internet ! Need your advise-Thinking of selling Gold and buying property. Do you think it is a sensible thought or should I stick with Gold. This is not a question anyone can answer you , if property is important for you, then go ahead, else not ! How will it make difference to the conclusion ? This will be my frist comment reguarding the gold. Do you think its possible to say that ? If it was known already , people would make millions ! We are getting a personal loan for supporting my husband’s business. I am thinking i will buy gold ornaments- plain with least making charges and wastages. I would keep them for gold loan and give my husband the money for his business. I would slowly take back the gold. By which i can support my husband and slowly saving. We have zero savings as of now and lots of debt as he started his business. I am not sure how much we can get return in business for this investment and hence thinking about this idea. We need to buy ornaments as they dont accept coins for gold loan. Will this be a wise decision? i dont want any big returns but wanted to save atleats this loan amount (10 lk). Please advice?? ?… I request not to advice on alternate investment – my condtion is not having money in hand and looking for option. It is before i throw money into blackhole (as we donno what will happen in our business), im just thinking of way that i will get back this sometime in future. Please advice as early as possible. Why dont you just go for a business loan with bank ? How does your situation help ? Thanks for the post. I have been researching on why and to what extent one should invest in Gold. In that regard, if you visit the World Gold Council website (www.gold.org) they have done analysis and research over various periods and found out that since gold has a very low co-relation with other equity classes, a 2.5%-9% gold holding in portfolio reduces the risk-adjusted return of the overall portfolio. Also, during times of crisis, like 1996 -98 East Asian Crisis, and 2008 crisis, it was found that gold had a very small negative correlation with equity, which reduced the VaR (Vaue at Risk – possibility of worst loss) of portfolio in such times. Is that report findings true for indian environment as well ? The only time to invest in gold is when you have no faith in the currency – such as times of wars. Even then, you can buy real assets such as land which give the same benefit i.e. protection against inflation (however much more illiquid and not easy to move around). Gold also carries a security cost. You need to keep it in a locker, and you run the risk of it getting stolen. Equity or land are so much better in terms of investment for long term that I don’t know why people are crazy about gold. One reason I can think of for investing in gold rather than real estate is the higher incidence of fraud. In big cities like Bangalore where land shark are rampant, it is very difficult to clearly identify if a real estate is clear from all legal perspectives. Even if a lawyer indicates it is clear at the time of purchase, you never know who stakes a claim in it in the future. This will not happen in gold if purchased from reliable sources like government refinery etc. Investing in gold for 1 year is better or investing in FD for 9% is better ? If gold prices will move higher than FD rates , then its better ! do you think investing for gold for a year is a good idea? what returns can one expect after the current growth in september…will it sustain? Is it a good time to invest in Gold or in Silver for long term like 25 years? Yes, if gold prices rise always , but no one can predict it ! Manish, am looking for some information on how Physical & Silver Gold rates are decided at the jewellers showroom. Could you point me to any resource on this kind of information? can i invest in gold this time for a good return. have you seen that return from 2010 to 2011 is 42.7% so dont you think it is very much. thanx alot for excellent analysis. can u guide me wich is d best season 2 invest in gold in d present day scenario.? There cant be a best season like this , what is your time frame ? Gold investment has no locking period, if you want to invest for tax saving then invest in Tax saving FD for 5 yrs ! If I buy GOLD COINs and not a Jewellery, CAN we convert GOLD COIN in to Jewellery. ? I heard from somewhere that , GOLD COIN can not be converted in to Jewellery as they are of 24 C and Jewellery are made of 22 C or 18 C? Excellent Information, very useful and informative as well. I have a small query to understand. I want to invest in GOLD but trying to understand 2 things. 1) Should I invest in GOLD Jewellery or GOLD COINs, does it make difference (may be Jewellery is expensive than COIN) ? 2) Should I enroll for a Flexi Schemes (like Tanishq 11+1, where in 11 installment would be given by a buyer and 12th installment is given by Tanishq). or should buy in one go, does it make difference in Price of GOLD in one year.? Because then moment my flexi schemes get matured, of course the price of the GOLD would also increase. Yes it will be better than physcial jewellary ! Do note one more thing that the gold coin will not be accepted at the banks in case you want to give it to the bank for availing a gold loan. It has to be jewelry that has to be given for getting gold loan. You may just have any small round thing attached to the coin (to use the coin in necklace) and make it as a jewelry item but that would cost a making charge but only minimal (say 2%) compared to a real jewelry item which may be 16-22%. http://xa.yimg.com/kq/groups/6548896/1091899790/name/Morgan%20stanley%20… Morgan Stanley report on CAGR over last 15 years for gold , equity , bonds and property . Crucially the most important thing is Volatility for Gold is just 12% while for Equities it is 40% . HOw many strong souls are there which can see their MF go from 100000 to 50000 and stay put ?? Gold has had one way … UP !!! Not a single down year in last 15 years . And to say that every person whom I have ever seen on TV has suggested to buy gold as just 10% to 15% of their portfolio only . ??? They would say it can work in practice that you make same amount of money buying gold with less than 1/3rd of volatility(read it as peace of mind) but it can never work in THEORY . Since I have spend 2 years doing MBA with excel sheets where i fancily project cash flows of companies whose names I did not know 2 months back for next 10 years hence I will keep doing that . I cannot value gold as it does not give cash flow hence you should have it as 10% in portfolio even though I could open my eyes and look at the REAL returns made by people holding GOLD but I will just ignore it . When looking at a straight up gold growth in RUPEE terms you said -Well why do not you look dollar terms returns and you know they are bad , it goes up and down . So I ask you why dont you show equity(sensex) returns in $ terms . Here I have made your job easier . Anyone who says sensex over 30 yr has given 17% CAGR in rupee terms needs to see what sensex in dollar terms . Guess what its a meagre 8.5% return in $ terms but you will say hey put your money in equity only and not gold jewellery . Now I think you would know why Warren buffet does NOT put money in Indian stocks for a measly 8.5% nominal Dollar returns over 30 years . So much so for spectacular growth of Indian equities. Gold is money and it has been same for thousands of years . As you can see govt cannot print gold as Indian govt has done over last 30 years . If you see 1 USD = 8 INR in around 1979 but today its about 51 but USD has actually lost almost 50% of its values against a basket of currency around the world .?? What does that mean ?? It means that Indian govt has printed so much of currency that its losing its value greatly . So how to protect yourself from that loss in value ?? Have gold physical gold . Please answer the comment#87, rather than skipping it. The question is more of discussion type and it needs more than one person inputs , hence I suggested forum . I think this article would very well complement with your gold price movements articles (http://insight.banyanfa.com/?p=363). I have tried to explain the reason behind the gold price movements and the possible way forward. My inspiration was one of the seminars held by a leading Investment bank where Head of Gold Trading of the biggest Investment Bank expressed his bullish views on Gold. Would really love to hear your views on the article. Thanks . .will go through the article soon ! . I would look forward for your views. I believe equities can perform much better in the long run as compared to gold looking at the past data when India was growing at a average pace of 4-6% and future prospects of India growing at a much faster pace. Gold took 51 years to move from 100 to 18500 (Year 1959 to Year 2010) where as Sensex took 31 years (Year 1979 to Year 2010) to move from 100 to 18500. It doesnt mean gold have given half the return given by Sensex. The compounding effect can be much more. Yes Mayank , thats true … not sure what conclusion you want to make at the end ! Very Good Article On Gold Price…. I had a query. Is it a good idea to go for (Existing) Gold Loan and buy more Gold for a 2 years span and sell it after 2 years to repay the loan amount? Any statistics that I can expect profit/loss in this approach? GOLD LOAN AND BUY MORE GOLD ? Just got into this article as it had a mention of my view. Also one of the major co-relation of Gold is with currency which many of us might miss. So i would prefer looking at Gold in US dollars where i believe the returns is sub 5 % over the last 100 years. Gold may be a small part of the portfolio but dont consider it to be something which will provide consistent returns. Thanks for your views .. will look at that article ! These 2 charts will help us actually define the purchasing power that 2 paper money & 1 metal hold, because we in India grew at less than 3% for last part of last century, while Dollar ( the western currencies ) appreciated more in the same time, the gold price vs rupee seems depressed. Yes .. your points make sense .. however this article does not take that into consideration and there is no conclusion made in this article ..
Ichimoku Trading system is little popular among my readers for low risk trading. Its a strategic tool rather than a forecasting tool. Gold Historical Weekly Charts had turned to buy mode this week. And my ichimoku charts double confirms it. World simply consider gold to be the safest among any othe commodity/equities/financial instrument. Your comparison for last 86 years though nice but doesnt looks decisive to me because this feeling of safety regarding gold has risen tremendously since last 10-15 years and is still increasing. Also Long term trend analysis is useful only if factors affecting same are constant, while in case of Gold we have seem paradigm changes in factors affecting gold. Thanks Manish for informing us the data in detail. 1). The CAGR has been mostly around 8 to 10% which is not so good enough to woe a investor (since inflation was nearly 7% in last 30 years or so) ………. 2). Rather One should invest in PPF if not in Equity SIP, bcoz PPF will give atleast 7% guaranteed (Though at present it is somewhere around 8.5%) …..Wats your views on the same…..?????? I think you have provided a very valuable insight upon the movement of gold prices in past 4-8 decades. I think the primary reason behind the consistent movement in the gold prices has been a very limited stock of GOLD commodity on planet earth. It may surprise people, but a very common fact is that the total gold ever mined is 165000 tonnes out of which over 25% is owned / bought by India. To give it a perspective, the total global production for Iron in 2010 alone has been around 2,400,000,000 tonne (around 14500 times more than gold). The wealthier we all are becoming these days, the more will be the demand for Gold and hence it would push up the prices. Adding fuel to the fire is high liquidity in the hands of Investment Banks all across the world. Probably if I have free unlimited source of money, I shall continously buy Gold in large quantity (blaming uncertainity around the globe) – this would push up the gold prices. I would then ask my Gold analyst as well to say that Gold is going to go higher and higher so that every one also jumps upon the frenzy to buy Gold. AND when the time is right, I shall slowly start exiting Gold and make a killing – this would be slump of Gold for a couple of years atleast. Hence, though bullish on gold from a long term perspective, I tend to be a bit cautious as well considering what is happening in the global markets. Thanks for your views on gold . Interested in your suggestion Manish San. Say if I have 200 gm of Gold Coins (100 gm bought in 2007 & 100 gm bought in 2010) , is it wise to sell it *now* and book profits? What is your opinion Manish? Wrong question .. the answer would only depend on how you think about it , not me .. I am not a great follower of gold and I believe in taking the profits out .. so I would sell. but you might not think like that and you should not be .. Take your own decisions . gold’s shine is forever. we will see more increase in gold price if we see more debt problem in US. what is your justification ? Manish there is a very interesting point to note over here which I think not many people including you have noticed. GOLD in 1979 was 937 and in 2011 was 26,400 roughly 26 times. The SENSEX in 1979 was 100 and in beginning of 2011 was around 20,000/= ie 200 times! Yea i didnt look at that point , but its very known fact that over long term gold would have delivered just inflation linked return where as equity has given far better return . A considerable amount of research and data collection would have gone into computing the above figures and graphs. An excellent work that provides comprehensive data for gold lovers/investors. Personally, I have never been interested in gold. After looking at the figures you have provided, my guess is that gold prices will drop during 2012 and 2013. Depending on how much it drops, the end of 2013 and/or the beginning of 2014 may provide good buying opportunities. It is only a guess. Great article as usual Manish …. But what if Gold meets the fate of Aluminium which, back in 1800’s was considered a status symbol, costlier than Gold. Napoleon III, Emperor of France, is reputed to have given a banquet where the most honoured guests were given aluminium utensils, while the others made do with gold. But one gentleman from Russia found out the cheap process of refining Aluminium which is known as Bayer Process which led to a massive fall in the price & stature of this metal. I fear if that happens to Gold, where will all the investors specially nations fall to? Gold is a rare metal that glitters, value is based on rarity mostly, not much on purification. Aluminium is not rare. Thanks for your good info. Since 2004 I am regularly purchasing 1 gm gold in physical mode on each month.There are no lapses.Can I conti this for another 10 years?I have kept record of my all purchase.I dont want Gold in paper form.Thanks. Yea you can do that .. I understand that Gold retains its purchasing power over a long period of time. This means that real, inflation adjusted, returns from Gold would be close to zero over a long period of time. Your data looks like it is confirming this theory. This also means that Gold should not be viewed as investment (something which gives good real return over a long period of time) but should be viewed as insurance (something which protects its purchasing power over a long period of time). Think of a country like Zimbabwe where inflaion was beyond control or a country like Pakistan where inflation is very high double digits since long time or a country like Libya which is in chaos and there is no sanctity of local currency. It is hard for any domestic asset like stocks or property to produce real returns when inflation is running at, say 20% plus level for many years. In times like this, Gold shines. Therefore, Gold should be bought on SIP basis to make it about 10% of networth, in my opinion, irrespective of its price. If, God forbid, India heads to Zimbabwe way or even remotely close to it, this 10% allocation to Gold can make difference of life & death, financially. If you think India can never be like Zimbabwe, I wish you good luck. We have just embarked on biggest welfare scheme in India’s history by making it constitutional right for 65% population to get food grains from Rs 1/- to Rs. 3/- per kg forever. (Please remember, this Rs. 1/- or Rs/ 3/- per kg price can not be changed anytime in future, inflation in food price notwithstanding). This will only lead to spiral of money printing and high inflation over the years. We even do not know what else will come in future – may be free healthcare to 65% of population? Basically what I mean to say is this – in all financial planning, normally all focus is on domestic assets denominated in rupee. No one thinks of scenario of what if currency goes for a toss like Zimbabwe or Soviet union? I do not think financial planning is complete without safeguarding purchasing power of your networth against rackless political schemes. If India does well, your 90% of assets (other than Gold) would do well and you need not worry. If India goes to hell, your 10% allocation to Gold will feel like heaven. Yea i agree to your points , where did I say that India can not go Zimbabwe way ? I agree to what you say .. but also look at how good the chances are for that in near future .. we can take those assumptions and plan things right now , I feel that would be being too cautious , dont you think so ? As I said, I consider Gold as an insurance for networth against unforseen kind of events, Black Swans so to speak. In another words, Gold is similar to networth as life insurance is to death. These events, be it huper-inflation or India – Pakistan war or rapid rupee depreciation etc will always have very low probabilities in near future, just like my death is. However, as time to take out insurance is when you don’t seem to need it, time to buy Gold is when you don’t seem to need it. Besides, I am advocating not more than 10% as allocation to Gold. If the need for this insurance doe not arise then it is fantastic for remaining 90% allocation. It will not matter if 10% allocation to Gold returns only 5% in nominal terms beccause, in such cases, remaining 90% would have erpformed well. Hence, I consider regular buying of Gold up to 10% of netwroth is low cost insurance for a lifetime’s hard work and prudent financial decisions. What is your view regarding buying of Gold on SIP basis, to a limit of 10% of networth? Equity (Sensex) — 13.2 % . 15 yrs is a long period pls. But that is not just about a 0.5% difference in returns but how many times the prices of gold went down or crashed or were volatile (if you are MBA types taught in B-Schools that volatility is risk which is crap) . Gold Volatility has been 12.8% and equities 40% . Almost all of gold volatility has been on the up while everyone remembers 2008 when sensex crashed almost 50% + within 6-8 months . Some intelligent soul will say well you should have bought then . Oh yes had investing been so easy that people would have picked up sensex at 8000 in 2009 then most would have become warren buffet (or on way to become him) . How many have the guts and intelligence to see their stocks go down 60% from top tick to bottom tick n hold on ??? How many actually buy low and sell high ?? Gold on the other hand almost always keeps going up slowly n surely . MBA guys will say volatility as a measure or risk which is crap . Risk is permanent loss of capital over a extended time period of time . Gold has never done that . Equities do it so frequently that I better not go into that . And if someone is soo controlled that no matter what happens he will only invest in SENSEX and not use his brain (n easy earned money ) to start picking up stocks then of course he will make money more than gold . I mean most common investors will get into equity game only when sensex has gone up 30% + in last 1 yr or two and get sucked into buying individual stocks apart from MFs . Because nothing dulls anyone’s intelligence than easy money . Then people start to buy DLF , Unitech Lanco Punj LLyod etc who are touted by everybody on TV in 2007 for wonderful opportunities . Unfortunately the volatility there is not just volatility but its permanent loss of capital FOREVER . Understand difference . Any stock which goes down by 70-80% NEVER recovers . And most purchases in bull market by normal people occur on these very stocks . But this is never case with gold . The point I am trying to drill down is this — so many guys are ready to fool you (read corporates , brokers) to give them the money because thats where their incentives lie .They wont get their bonus if they dont make you buy sell securities . Look at how MF sales have nose dived because commission has been reduced . WHy ?? Simple they were selling coz they will get commissions . If they sell you gold they wont . Hence every single guy worth his MBA and excel sheet mentality will say here is next 10 yrs of cash flow of xyz company with value this and buy stock . But when it comes to gold they wlll say put only 10% into that . Coz it gave almost exactly equivalent results of equity over 15 years or 20 years with less than 1/3rd of volatility ?????? Really only 10% to gold . ?? How many of guys writing posts here bought more in early 2009 than sell ??? I challenge anybody who says gold to be only 10% of portfolio to show their DEMAT account transactions as to whether they were buying or selling equities during dark days of 2008-09 ???? Most people do NOT understand that gold is a way to protect yourself from Govt printing of money . Gold has held its value over last 5000+ years of civilizations . Every single guy who has commented on this post has said same thing — pls limit gold investment to 10%-15% of your investible amount . If you look at the above returns you see a 0.5% of difference in the returns of last 15 years . But then you say put only 10% of your networth in gold . Why ?? If you are good enough to enter in 2003 and exit in 2008 please send your resume to buffett . He is looking for investment managers . You say gold as a insurance ??? and not investment . How many of you guys slept soundly in September -August 2008 ??? Unitech halved in less than 2 weeks . Did you held on to the 2nd largest real estate player ??? u r down 80+% . For other mortals dont say put only 10% in gold which has given equal returns to investors with not a day where you feel pressurized or no sleep at night because what some bloody americans did in their country and a crash in Sensex ensues. Please say this put SIP in gold but you can put 33% each in Gold , MFs (strictly MFs n NO individual stock picking) and Bonds . 10 yrs from now if this blog remains I will be happy to eat my words. I am sure the intelligent mortals saying 10% gold in networth will still be saying that . Huh. I am still not convinced! There is nothing to convince here, its just some graphs where you need to take your learnigns yourself ! very conceptual….. this has changed the way i think…. CAGR of 10% doubles the price in roughly 7 years. Gold has given a CAGR of 10% between a long period of 86 years, which is not a small return. Without inflation data at hand, it looks like Gold has indeed kept pace with inflation in these 86 years. I am confused as to a) which base year should we take? b) What are the reasons that price of gold rose from 1968-1988? and again after 2002? Kirti i loved what aaron levenstein said. Very good analysis. I never understood Gold, so never invested in gold ETF’s. Happy with gold in physical form. Do you suggest investing in gold 1gm per month as i have been doing it since 2009. I purchase hard gold. Planning to carry on for a long term investing this way. what do you suggest ? No harm in investing in gold , it will keep your money diversified .. but make sure your expectations should not cross 10-12% in long run , anything extra than that will be bonus. The volatility in gold prices also one of the things you will have to live with . Just I forget to mention one more thing in above comment. It would have been better if analysis have done based on dollar terms than indian rupees.In 1980,after sharp spike,Gold prices in international markets were nearly halved afterwords which do not reflctet here. One query,prices shown in first table are average for that year or picked for a particular date?Sorry if you have already mentioned it and I do not catch it. Thanks for giving the detailed graphic explanation. We can see from the grapf that sinces 2001 till date the prices are rised steadily up to 2006 but afterwords increased considerably. Why this has happened is it due to depriciation of Rupee or otherwise. My conclusion is that gold never give you long term return on your investment more than inflation rate. Manish, why dont you comper the return of gold against inflation so that it will give us clear picture of our investment in gold. thats a good point .. I have no idea where to find the inflation data for very long term .. Any idea where can we find it ? Indeed the article was great. For the inflation data, you can have a look at http://www.tradingeconomics.com/india/inflation-cpi. But that does not allow to export the numbers in excel for FREE . I will recommend to compare it with CPI ( Consumer Price Index ) instead of inflation. This data may prove useful for you, in this article & future ones. Thanks for that data .. will look at it ! Very nice information you have shared. I personally believe that one should expect a reasonable return of 9-10% when you are holding it for long term.In shorter term you can see the other side also and hence it is more of speculation. The problem is that seeing the short term performance, investor starts considering it for long term holding. The asset is good when you buy it for the real consumption but should not be looked as an investment product for higher returns. A very very infomative article. Good to know you liked it .. what are the key learnings you took ? Yes you done well. Thanks for the articles. last years it shows a jump in gold prices and it gives a doubt that there may a correction also in this year or coming year. Yea but those kind of jumps keep happening , and you cant really take them as basis for decision like selling .. Fantastic article. I appreciate your efforts in doing a thorough analysis of the gold prices over the decades. I need your expert advise whether is this the right time to buy gold ?? thanks Manish, very nice info shared.. This is amazing!! So much of gold movement data is a wonderful treasure for a person who is really interested in investing gold. Great!!! I very happy to get these article for gold.I also interested in investing in Gold but don’t know which time is best for investment & in which mode.So, you can give any advice for it .I want also to maintain 10% in portfolio. My conclusion is this: I should not shy away from selling some portion of gold when in need of cash for a goal/emergency. But the current mindset is to always sell equity first and keep the gold for generations — till you are great grandparents. In other words, try to cultivate some love for your well performing funds, just like gold. A very nice article as usual. You seem to have done a lot of homework for this. I think, the charts only suggest one thing, there is still some steam left in Gold at the current levels. I am bullish on gold. Moreover, I believe, one need to have atleast 8-10% gold in his portfolio; and any time is the right time to buy gold, as long as you buy it. It depends on the commentator and in what context its written , If you are looking at it purely from return point of view, truely speaking no one can predict it.